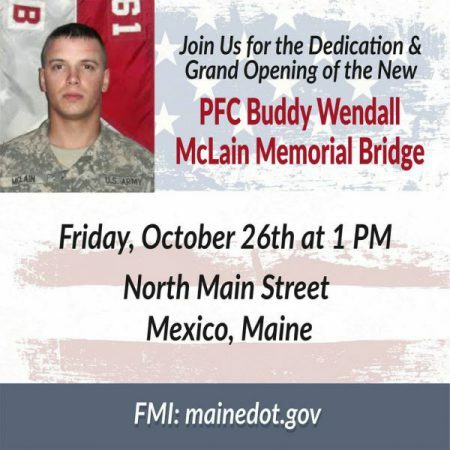 Please join us for the Dedication and Opening of the new PFC Buddy Wendall McLain Memorial Bridge. Festivities will include music, unveiling the plaque naming the bridge, a ribbon cutting and guest speakers. The Bridge is on North Main Street in Mexico, Maine and public parking is available at the Mexico Park & Ride Lot, the Legion Hall and other areas that will be clearly marked.